It's great for wool or meat, not the best for milk and eggs. I keep around 20 wool animals for each herder and they move from item stash to mineral deposit. During the winter we move down south to trade. I make a small village on those deposits and process the wool there, it's easy getting inspirations there. Keep a doctor close with herbal medicine and your animals can now be saved from the plague. Keep your herders on penoxyline. Drop podsfor if things get dire. Small groups make the raids not to hard and sickness does only effect one group at a time. I was once at an outpost. It started with a little skirmish, when my rifleman killed one of them off and they started the attack. It did not take long before they started fleeing. No message that we won, could not claim annything, must bugged? Shot the door open, a guy was sleeping in there, we surrounded him and openend fire, I still wonder if he woke up. No inspirations for my pirates apparently, no wonder they are losing the war. General Discussion / Re: Merciless Wealth management. Actually you can have all the wealth in the world. 500 golden grand statues, doesn't matter, exploits though. Normal playtrough, don't own stuff you don't need and keep animals in check. Few fighting animals is allright, untrained they can act as a decoy. General Discussion / Re: How are people changing clothes for battle? Melee has it's uses, lancers and raiders with guns are totally helpless againts them, you just got to be carefull for that other lancer or raider. Drops pods can be surrounded with melee with attack animals. During a toxic fallout, battle horn, siege. All I had was a mortar stolen from an outpost and three incendiary shells. We fired all of them, all missed, but the fires kept them busy. Eventually they went to sleep, we grabbed every melee weapon we could find and sneaked our way in. 7 of us vs 8 of them, all we lost was a toe, they lost all of their members. Toxic fallout did help out a little. Two of them were equipped with bolt action, all i had was some recurve bows and two shotguns, on a flat map with hardly any cover approaching their camp, good luck. Shooters can shoot and retreat, melee is always committed, if you cant retreat you have a problem. Late game tribal hordes, no place for melee, even with animals it becomes messy. Try changing clothes during a drop pod raid. I guess to get your expensive stuff used up faster. General Discussion / Re: Is there any downside to psychite tea compared to the other two social drugs? I use psychite for caravans. Ambushed, we all drink some tea before the battle, gets rec up usually they are bored and gives a nice mood boost. Beer after a battle in the base. Smokeleaf gets used in the hospital as a pain killer, if it does not kill the pawn. Not much experience with hard drugs, but Go-juice is a nice combat drugs. But still prefer no hard drugs for my pawns. Learn to accept losses in material. Building a line and trying to hold that line at all costs does not really work with these kind of weapons. What would have happened if your colonists were not behind the turrets and a bit further away. 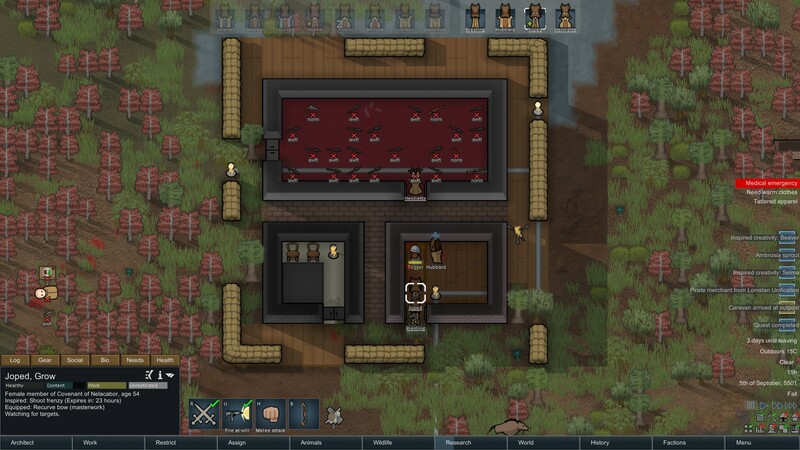 The turrets would be a target and your colonist are not (if they are retreat) They would have blown a hole in your line and then start proceeding into your base or go after colonists. That is where raiders start spreading out, single targets can then be killed off by melee guys, while other raiders start bashing on walls and doors. Hallways with traps will help with taking them down. Retreat further and further into your base, if they bash some walls that would be allright. Double walls are actually pretty good for keeping stuff a bit safer. Any area to dangerous to be in you will retreat, untill they take enough damage from traps or are so spread out that you can reconquer parts of your base. Damage to your base does not matter, keeping your pawns alive does. Well losing food might be the exception, keeping food in more then one area is a good idea. General Discussion / Re: So I’ve got a problem with plan amount of raw food ingredients? 10x 10 field year round growing(normal soil) should provide enough simple meals for 5 colonists. Add meat and you have enough for 10. But that is very basic, gut worms, gourmands, other stuff forces you to use more. So two fields of 10x10 and you would have more then enough for 5 or 10 (with meat) once in a while you grow something else on one of the fields. General Discussion / Re: Better item storage? Best storage unmodded would be drop pods. 5000 meat and it doesn't even spoil. I will make a longer post later when I want to. We have around a 100 dromedaries and a few alpaca's caravaning around the world. Keeping a stockpile close with all the stuff you want with you works well, my caravans are filled up in no time. Offloading is even more fun, I also keep a caravan outside my town with stuff that is regularly used, that helps a lot. For approaching a site, I let a strike team rest before attacking, then in the morning I roll in with the furniture. I check for traps, deal with any dangers and then proceed with installing stuff as fast as possible and make a base for 2 colonist. One colonist mines and deconstructs everything, the other cooks simple meals and packaged survival meals, from berries and local wildlife. This works well on mining sites where you can set up a camping site. Tribe Pride has been hauling megascreen televisions trough the desert, so much fun. Another thing I very much like are the legendary and masterwork weapons, I have a 77 old granny killing dozens of raiders with her legendary heavy smg. Started a naked brutality, site randomly chosen, no rerolling pawns. What we got. Starting of, botched construction, incapable of cooking, yukky meals, oh I can craft some decent weapons and research them. Gifts, it started of with 241 silver, well thanks, maybe some medicine with the next trader. Second one a good LMG, then a normal assault rifle. Two pawns with decent weapons and so early. Then... some friendly people arrived. You have been chosen, behold the sacred golden plate armor of Southwest Heba Marsh. You shall be the protector of this holy relic. Thing sold for 8900, it proppeled me into midgame, but the raids.. It is still visible on the wealth chart when I got it and when I sold it. Components, advanced components and plasteel are the resources that are holding me back. Chemfuel , leather and drugs are moneymakers. It's a bit harder now to slaughter people but that would also be a good source of income. Chemfuel, leather might be to powerfull. Few clicks on the wildife tab and you're done. All 15 of us are almost complete bionic except for a few ears, It's not so heavy on plasteel, but the components and advanced ones got me 3 level 19/20 crafters. Hyperweave/Thrumbofur, I can keep my guys in thrumbostuff, 5 man with recurve bows (tried it with short bows, failed) complety in the open, no door cheese, are capable of taking one down, no bionics or fast walkers or something. Thrumbo sounds nice I guess, it's mostly tactics not what you are wearing. Power armor is there for the mistakes. Devilstrand is quite good for fire tough, but to much effort when I can train shooting. It's nice having a comfy chair, but it's nicer to have a powerfull gun. But in 8 years time we got 1 legendary and 4 masterwork charge lances. Doubt if you should use them for armor. Trade one is a bit weird, recruitment can be prepared for. Trade might be good for if you move out. did not try that. 50+ OP turrets + mortars. Turrets hold the enemy in place then a carpet bomb does the rest. Melee units, rockets and the flamepede are the biggest enemy of larger turrets. Better have a horde of scythers around a turret then a horde around my pawn. Protect your turrets and the turrets protect your pawns, might be a good one here. The smaller one's can be used as fodder. Steam folder with screenshots from research, fun thingy and wealth after my first three years, plus a couple with my pawns in action. After each year I take these. Did not see it anywhere, but this is my setup for cooking. By not allowing haulers near the two stacks closest to the stove, they will not haul 10 veggies there. But the cooks are able to haul from the shelves. That way they will haul a lot in one go. Haulers can now refill the shelves. Just make sure the cooks are restricted in such a way that they will not do to many other hauling jobs. Early game scyther defence. I have a couple around my base. This time pirates were looking around.